M5 will be present too! June 14 and 15 one of the biggest recumbents events on the planet takes place in Sloten, near Amsterdam: Cycle Vision 2008. M5 Recumbents will be attending with a stand, presenting the latest developments concerning our recumbents and high-end components. Follow the link below for information about Cycle Vision. To enable an even lighter end result of our recumbents with 26 inch (ETRTO 559) front wheel, we have been developing for the last months a new type of carbon front fork. The fork is suitable for all Titanium and Cr-Mo models with 26 inch front fork and the M5 Carbon High Racer. It's an M5 design double front fork, connected to a carbon 1 1/8 threadless head tube. We have chosen for the aeroshape comparable to the earlier developed 28 inch (ETRTO 622) front fork for the High Racer. 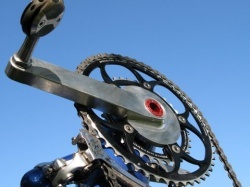 The V-brake pivots flow into the surface of the fork smoothly, thus avoiding the use of excess material. The weight of this highly stable 100% carbon MTB fork is just 545 grammes, being one of the lightest of it's type. The used type is carbon is 12 D in matted finish. Estimated availability mid-January 2008. Price will be equal to the 20 and 28 inch version. The M5 tailfairing is now also available in carbon/kevlar. 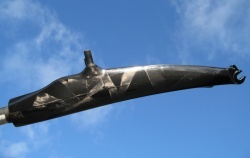 A very crash proof tailfairing is the result. Even with the better properties of this new fairing, the price is equal to the price of a carbon tail fairing. The Greenmachine is the result of years of prototypes and designing. The main features are the full chain casing and the good ventilation of the seat. Foundation Biking the Ocean is preparing a crossing of the Atlantic Ocean by a human powered boat. Their plan is to travel from New York to Amsterdam (Netherlands). Heart of the boat is an M5 Tandemframe, sponsored by us, including the seats, propulsion an other components to drive the boat's propellor. Click the link below for a lot of pictures and additional information (text in Dutch). Last week Greg Gross participated in a 4-man recumbent only team in the Texas Time Trials, an event that draws riders from all over the country. It is a tough course: 20 mile loops done 25 times for a distance of 500 miles total. The course has 1000 feet of climbing for each loop. Greg rode the M5 TiCa Low Racer that he purchased from Garrie Hill. On his first lap, he beated the standing lap time record by 1m15s, beating the previous record of 51:30. He was also told he had an unofficial record of most consecutive loops completed in under an hour, with 5 of his 6 laps. Lap times were 50:15, 52, 57, 55, 57, and 1:03. Below the a link to the internet site of The Texas Time Trials. Tijmen Hoeve passed the finish in 57 hours and 52 minutes. 76th place overall, first unfaired recumbent. Only two fully faired Quests were faster. Lots of visitors at our stand. 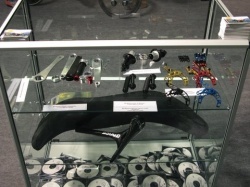 Not only attention for our recumbents, but also for the presentation of the M5 Light Weight products. After the extensive tests in the laboratory, we're now doing the testing "in the field". 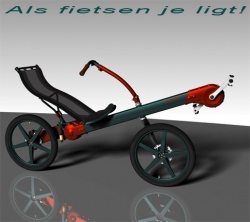 Several M5 recumbent riders are testing the cranks during a long time and a lot of kilometres.